The most common kind of private investing is in Mutual Funds (MFs) through an employer provided 401k. Unfortunately, most employer provided 401k plans have extremely limited investing options. These limitations and others, have caused many private investors to seek more investments options through IRA or other trading accounts. One of the many investment options is ETFs or Exchange Traded Funds. But how do ETFs compare to Mutual Funds? Below are some unique characteristics of each. Maybe this picture can help as well. 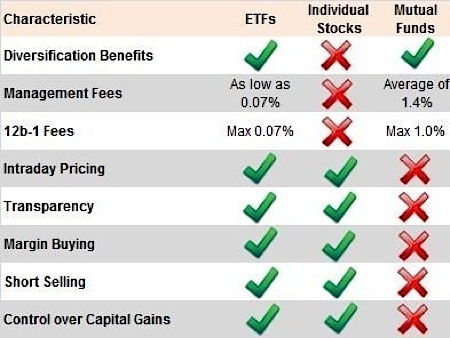 As you can see, ETFs have several advantages over Mutual Funds. As far as I can find, the only disadvantages of ETFs are shared by Mutual Funds.